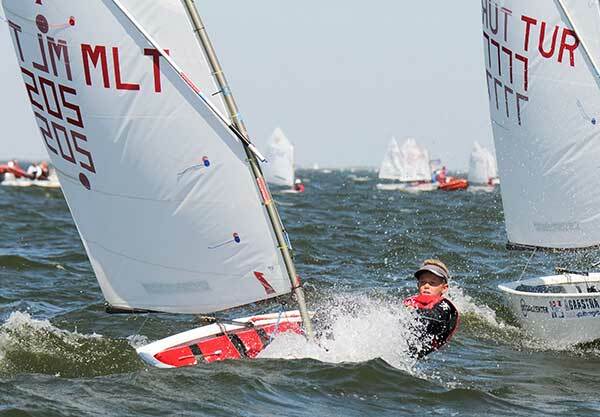 11-year-old Richard Schultheis (MLT 205) sailing to a prestigious victory at the Dutch Youth Regatta 2016. The Dutch Youth Regatta 2016 held over five days - 4th to 8th May - saw 704 youth sailors, 632 boats and 22 nations competing in its 12th Edition held in Workum. In all there were six different classes sparking a high competitive level of play. In the 29-er Class, there were 38 entries from 8 countries, namely 38-8, Cadet Class 34-4, Laser 4.7 Class 43-5, Laser Radial Class 44-6, Optimist Class 401-20, and Splash Blue Class 72-1. In this grand spectacle of sailing a team from the Malta Young Sailors Club (MYSC) proudly flew the Malta flag with most positive and honourable results. Our young heroes were Craig Farrugia Vella (MLT 86) aged 15, Victoria Schultheis (MLT 201) aged 15, Antonia Schultheis (MLT 202) aged 13 and Richard Schultheis (MLT 205) aged 11. The Malta team competed in the Optimist Class, the biggest of the six competing classes - 401 sailors from 20 countries. In fact the Optimist Sailing Dinghy, the largest junior class in the World, is an internationally recognised one design single handed sailing craft, where only sailors under the age of 16 years are eligible to contest in this class racing. “The Dutch Youth Regatta is one of the biggest Youth sailing events in Europe since many years. Usually it's well known for strong winds and cold weather. This year was an exception with light winds and sunny, warm weather” remarked Maurizio Bencic, the Slovenian professional coach assisting the Malta Young Sailors Club. In all 13 races were sailed in the Optimist Class, 10 of which were battled in light wind conditions, with 22 knots and plus characterizing the other three races. Results based on 13 races and 2 discards gave an outstanding portrayal of the fantastic performance of the Maltese youngsters. Youngest member of the Maltese team, 11-year-old Richard Schultheis (MLT 205) who in the first 8 races was even leading, won second place 8 points behind Swiss Max Wallenberg (SUI 1749). In the Benjamin Class (equivalent to the Cadet Class in Malta) Richard won with a comfortable distance in points from the second placed, Slovenian Daniel Cante (SLO 211). Magnificently the Malta flag shone all the way with a 4th placing overall to Victoria Schultheis (MLT 201), a 9th placing overall to Antonia Schultheis (MLT 202) and a 13th placing overall to Craig Farrugia Vella (MLT 86). Indeed a moment of pride to Maltese sailing in general and the Maltese Young Sailing Club in particular when having in the Top 13 placings - Malta with 4 wins, Germany 2, and Switzerland, Slovenia, Turkey, Poland, France, Sweden, and the Netherlands all with 1 win. The Schultheis family of German nationality have moved to Malta in 2011. Just a year later Victoria, Antonia and Richard yet unfamiliar with sailing joined the Malta Young Sailors Club for their first taste of the water sport. In a short spell of time besides this success in the Dutch Youth Regatta the Schultheis experienced other notable sailing achievements. In 2014 at the Optimist European Championship in Dun Laoghaire, Ireland: Victoria finished in Silver fleet with Richard in Gold fleet. In 2015 at the Optimist European Championship in Pwllheli, UK: Victoria won the Bronze medal with a 3rd in the Gold fleet, Richard came 3rd in the Silver fleet, and Antonia finished 25th in Silver fleet. Richard is currently leading the national rankings in the Optimist Class. “The Club feels proud of being behind the success of the three young Schultheis sailors who joined us 4 years ago and MYSC taught them sailing from scratch. Craig Farrugia Vella who started sailing with Birzebbugia Sailing Club joined the MYSC 2 years ago”, remarked Jean Paul Fleri Soler the MYSC Coach. “Over the past two years we have been working hand in hand with one of the best coaches for Optimists in the world, Maurizio Bencic from Slovenia, who is a professional coach and also designs Optimist sails for ’1 sails’. Mauro has been traveling to Malta almost on a monthly basis to monitor the sailors’ progress and to assist me with improving their sailing techniques . Mauro and I will be working together at the World Championships which will be held at the end of June in Portugal. He will also be the coach for the Malta team during the European Championships which will be held in Italy later this summer”, revealed Fleri Soler.